Here's where to watch every episode of Critical Role season 6. Mouseover or tap an episode to see where to stream it. Click or tap the play icon to stream it on the best available service. Episode 70 - Trust Oct 6, 2016 Still reeling from the revelations of last week, Vox Machina must weigh their options as they consider old alliances and new in their continuing fight against The Chroma Conclave. Episode 71 - Vorugal Oct 13, 2016 Everything comes to a head as Vox Machina faces off against the white dragon Vourgal and Yenk, a Goristro Demon from the abyss! The battle royale will be joined by friend and foe alike! Episode 72 - The Elephant in the Room Oct 20, 2016 The members of Vox Machina begin to recuperate, sift through the spoils of battle, and prepare for their return to Whitestone. Episode 73 - The Coming Storm Oct 27, 2016 Happy Halloween! The countdown to the final battle with Thordak begins as secrets are revealed to the war council and a possible site for the final encounter is chosen. Episode 74 - Path of Brass Nov 3, 2016 Vox Machina begin to assemble their allies at Fort Braxio, and take the opportunity to visit the City of Brass deep in the Fire Plane to retrieve the final vestige! Episode 75 - Where The Cards Fall Nov 10, 2016 The members of Vox Machina make their way through the City of Brass as they search for the next vestige, but a desperate gamble leads them into making a devil’s bargain. Episode 76 - Brawl in the Arches Nov 17, 2016 Vox Machina are caught in a street brawl against the pit fiend Ghurrix! Episode 77 - Clash at Daxio Dec 1, 2016 Fort Daxio is under siege! 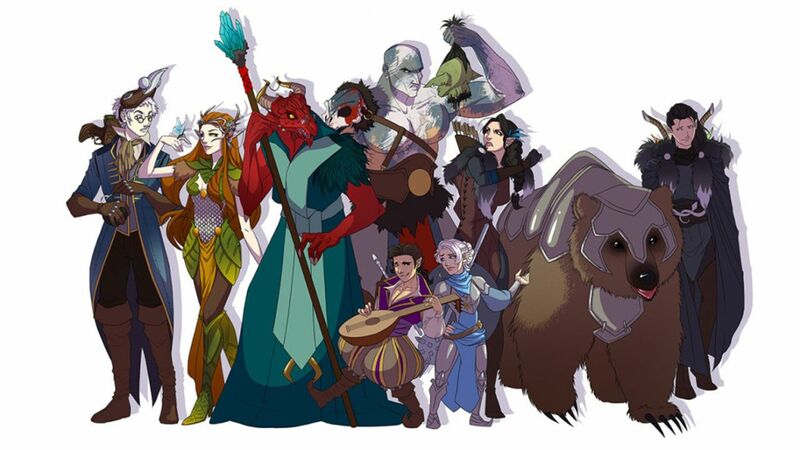 Is Vox Machina too late to salvage anything from the battle? Episode 78 - The Siege of Emon Dec 8, 2016 The battle for Emon begins! Vox Machina makes their way toward the ruins of the Cloudtop district! Episode 80 - Raishan Jan 5, 2017 Teetering at the edge of exhaustion, Vox Machina make a desperate play against the final member of the Chroma Conclave. Episode 81 - What Lies Beneath The Surface Jan 12, 2017 The chase is on as Vox Machina search for Raishan and the stolen dragon eggs. Episode 82 - Deadly Echoes Jan 19, 2017 Vox Machina has made their way to the mysterious island where Raishan is hiding. But the island itself may be an ancient and terrible death trap! Episode 83 - The Deceiver's Stand Jan 26, 2017 It's Vox Machina Vs. Raishan as the last member of the Chroma Conclave will either stand or fall! Episode 84 - Loose Ends Feb 2, 2017 With the Chroma Conclave defeated, Vox Machina begin to pick up the pieces.